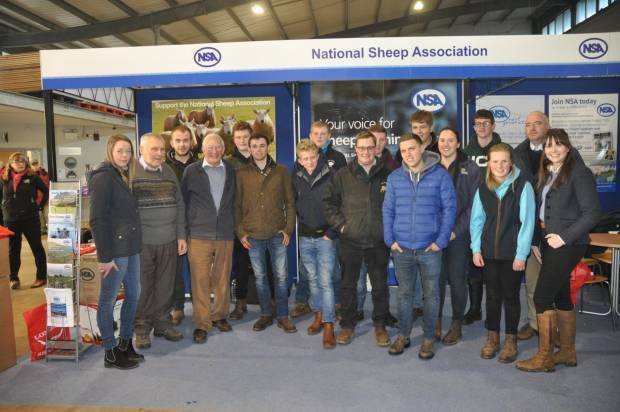 Showing enthusiasm in abundance for the sheep sector, National Sheep Association (NSA) was joined by more than 40 young sheep farmers at Thursday’s NSA Central Region Early Gathering ready to compete for the title of young shepherd of the year. The main shepherding competition of the day was the NSA Next Generation shepherd competition, kindly sponsored by the Texel Sheep Society, which saw 12 competitors aged 26 and under take part. Testing their knowledge and skills the young shepherds completed tasks including shearing, lamb selection, ram MOT inspections, medicine administration, ATV handling and a written test of their knowledge of sheep husbandry and the UK sheep industry. Not far behind Jack in the scoring was 17-year-old Harry Lyons from Congleton, Cheshire, who was placed second and also took the prize for the highest placed under 21 competitor. In third place was James Freeman, 20, of Wolseley Bridge, Staffordshire. The top two young shepherds from the contest qualify for the national finals of the NSA Next Generation Shepherd competition to be held at NSA Sheep Event in Malvern, Worcestershire, in 2020. In addition to this honour the top three competitors each took home a cheque from a total prize pot of £550, kindly donated by the Texel Sheep Society. The competition was also supported by British Wool, Suzuki UK, Willie Horner shearing and Reaseheath College. Texel Sheep Society Youth Development Programme coordinator Ailish Ross says: “The Society is delighted to once again support both NSA and the next generation of the sheep industry through this competition. The sheep industry is an exciting one to be involved with at every level and competitions such as this are a great way of encouraging young people to hone their skills and explore the many opportunities available to them in the sheep sector. Nipping at the heels of the NSA Next Generation competitors were six school teams from the NSA Central Region, a further example of the enthusiasm for shepherding in the younger generation. Also taking part in a range of sheep farming tasks such as foot trimming and condition scoring, the teams displayed excellent skill, with the average age of the competitor just 15. The Junior Shepherds Competition was organised by DART training, providing work-based training in Derbyshire, Nottinghamshire, Leicestershire, Staffordshire, South Yorkshire and parts of the West Midlands. Taking the title of the Junior Shepherding team of the year for the region was Queen Elizabeth Grammar School from Ashbourne, Derbyshire. Their team including Josh Bowman, Arthur Toon, Will Edge and Jaydon Clamp was presented with prizes of educational resources on sheep farming and agriculture for their school.